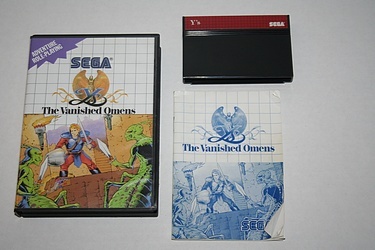 Finishing the week with a classic Sega Master System title is something that could happen all year long, and I think we'd be the richer for it. And when I say classic, I mean it - this is one of the best regarded titles in the library. Sure - something like Alf or Buster Douglas Knockout Boxing may have a big price tag, but you would be hard pressed to find a fan of the system who puts those games very high on a playability and quality scale - though yes there's always a fond place reserved for cheese. This, then, is Y's: The Vanished Omens, and you either already like it or you probably would if given the chance. Click through to read the manual, marvel at some beautiful line art, and see the full packaging breakdown of this magnificent title! Yes, I know I have a terribly placed flash glare on two pages of the manual - what are those enemies called again....Curly? Straczynski? I'll be fixing that in the next photo batch - though I do rather like those two names.